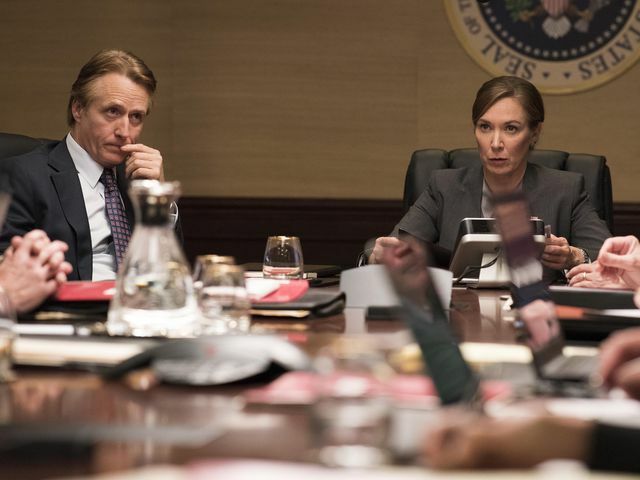 On the latest episode of Homeland, Saul (Mandy Patinkin) found himself in a standoff with Brett O’Keefe (Jake Weber). 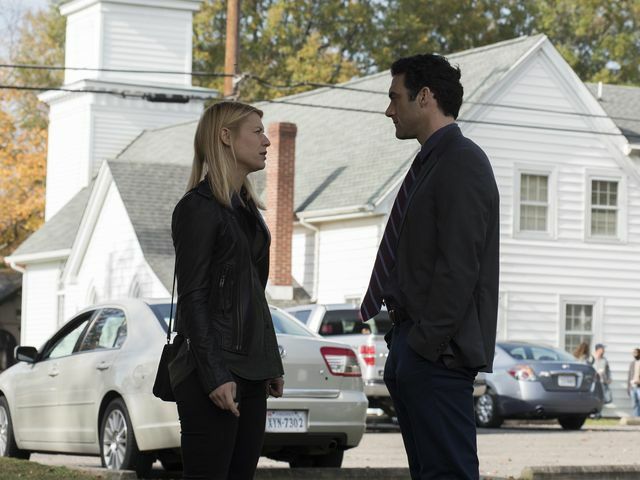 If you want to avoid spoilers for Homeland season 7, we suggest you stop reading now. 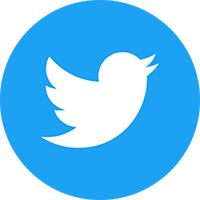 If you don’t mind then please keep reading. The episode opened up with Carrie (Claire Danes) sat waiting for her psychiatrist (Sakina Jaffrey). Carrie looked a mess with blood in her hair following the confrontation with the hacker who locked her laptop. She was manic, jittery and talking really fast. Her psychiatrist agreed to give her 5 minutes and was obviously concerned. Carrie lied about what had happened with a made up story. She said she was having impulse problems and not as risk-averse as she should be. Her main concern though was that her lithium was no longer working to control her bipolar disorder. The psychiatrist agreed to look at her medication. Back home, Carrie had to apologise to her sister Maggie (Amy Hargreaves) who had been worried where she was. Carrie explained that she had been to the shrink and wasn’t herself. The psychiatrist had prescribed her Seroquel to knock her out to break her manic cycle. Maggie gave her a hug and said they’d get through it. After taking her medication, Carrie went to bed to sleep it off. She was awoken by her phone and the door bell ringing over and over. She dragged herself out of bed and discovered Dante (Morgan Spector) at the front door. He had identified the woman in Wellington’s home as Simone Martin (Sandrine Holt). She had romantic ties to Wellington but more interestingly had received a parking ticket close to the prison on the day McClendon died. At first Carrie wanted to just go back to bed and said she couldn’t go with Dante. He insisted, so she took some Adderall and got dressed. They went to stake out Martin and sat in a car across the street. They observed her on the phone before she got ready to leave. As she left, Carrie got out of the car and told Dante to follow Martin. While he did that Carrie broke into the house to have a snoop around. Inside she took photos of the parking ticket and various documents and pictures. She also took a copy of the hard drive on Martin’s PC before leaving. As Carrie crossed the street a police patrol car saw and stopped her. She matched the description of someone seen breaking into Martin’s house. Carrie tried to talk her way out of it but the police insisted she get in the car. Carrie refused to give any information, not even her name. At the station the police tried again but Carrie refused to tell the truth. She tried several stories but in the end they decided it was best to just book her. Carrie didn’t want to be in the system because of the problems she’d had keeping her daughter and tried to resist. Later, Dante used his influence and had Carrie released without charge. Meanwhile, Saul and the FBI were heading out to the location where O’Keefe was staying. They parked their five SUV’s at the end of the road and Saul decided to go in alone. He asked to speak with O’Keefe and said he wasn’t leaving without seeing him. O’Keefe eventually came out, flanked by armed members of the community. He spoke to Saul and said they wouldn’t be able to take him without a fight. Saul suggested sitting down in view of everyone and talking it out. O’Keefe went back inside and promised to think about it. 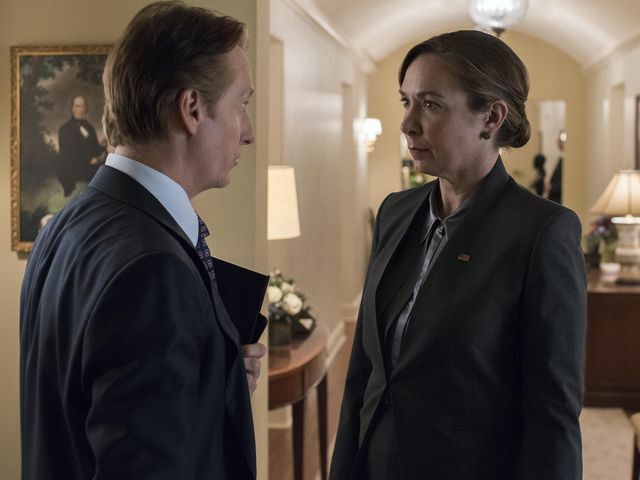 Saul spoke to President Elizabeth Keane (Elizabeth Marvel) and Wellington (Linus Roache) to get authority to make a deal. They reluctantly agreed but after the phone call Wellington suggested to Keane that they drop all charges and let O’Keefe go free. Keane refused to agree and wanted him arrested. Next Keane attended a military briefing where General Rossen (Fredric Lehne) gave her options for a strike on a weapons convoy travelling between Iran and Syria. She rejected the strike because she had the same briefing a week earlier and rejected it then. The General assured her it had been updated but she wasn’t interested. Inside, O’Keefe seemed resigned to being arrested. His mind changed when he was given a different option. One of the men said he could get reinforcements. After hearing that, O’Keefe decided to go out speak to Saul. He asked Saul to get rid of the guns but Saul said not while O’Keefe’s men had theirs. Saul said all the things O’Keefe was talking to him about were worth debating. He also said that he needed to stop spreading lies. O’Keefe said they would have to come in and get him. Saul said soon they would soon cut him off from his audience by jamming his communications. Saul asked O’Keefe what he wanted and got a list of demands. These included safe harbor for his girlfriend Sharon (Lesli Margherita) and a televised trial but Keane refused. Inside, O’Keefe spoke to Sharon who wanted to leave. He told her they weren’t going anywhere and said the FBI had no idea what was about to hit them. He suggested she go back upstairs. Sharon managed to sneak out and get to the FBI. She warned them what was about to happen. 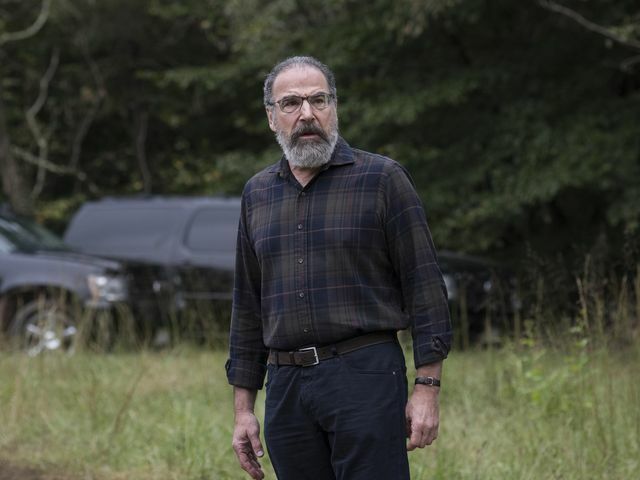 Agent Maslin (Matt Servitto) ran towards Saul and shouted for him to get back to them. Before Saul could get away, O’Keefe’s reinforcements arrived and grabbed him. Maslin and the FBI drew their weapons and demanded Saul be released. They eventually let him go and then all went inside, ignoring the FBI. Wellington updated Keane and tried for a third time to get her to pass the airstrike. He said it would deflect the news away from O’Keefe but she again refused. 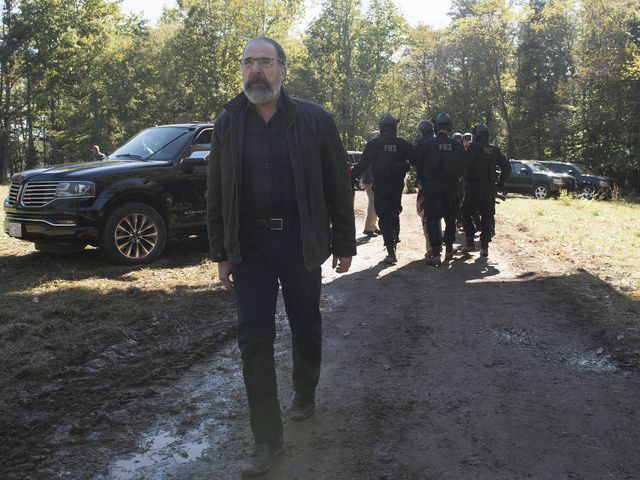 Back with Saul, the FBI brought in more agents and armoured vehicles ready to storm the compound. At the end of the episode, Wellington gave General Rossen a call. He told the General that Keane had changed her mind and approved the airstrike. The General said he needed to hear from the President but Wellington said she wanted him to just get on with it. Wellington said it was best to push on before she changed her mind again.